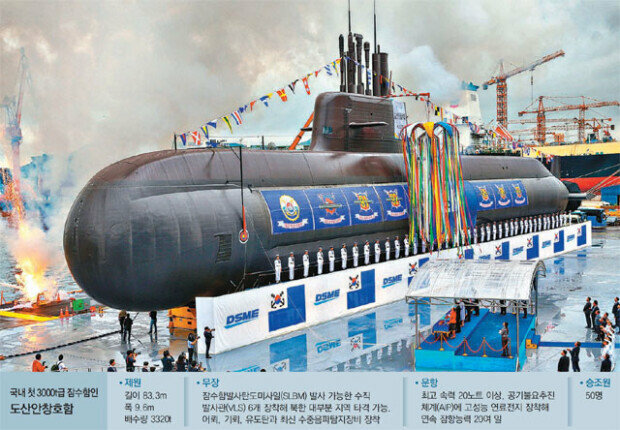 S. Korea to launch its first 3,000-ton class submarine. September. 15, 2018 08:11. alwaysj@donga.comysh1005@donga.com. The launching ceremony of the Dosan Ahn Changho submarine (3,320 ton), the first 3,000-ton class submarine in Korea that has been built using indigenous technology, was held on Friday at the Okpo shipyard in Geoje, South Gyeongsang Province in the presence of President Moon Jae-in and other government and military officials. South Korea has become one of the 10 countries around the world to have a 3,000-ton level submarine. It cost almost 1 trillion won and took four years to build the first 3,320-ton submarine in Korea. The submarine is much bigger in size and has better firing and navigating capabilities underwater than the Jangbogo-I and II (1,200 ton, 1,800 ton, respectively) submarines. In particular, it is equipped with six vertical launching systems (VLS) that are capable of firing submarine-launched ballistic missile (SLBM), enabling it to strike nuclear and missile bases across North Korea in the shortest time possible from the East and Yellow Sea. Furthermore, it has better combat power than other submarines in the same level with its state-of-the-art combat system and sonar radar. The Dosan Ahn Changho will undergo more tests, be transferred to the Navy in 2020, and be finally deployed by 2022. The military is planning to build the second and third 3,000-ton level submarines with 10 VLS by 2023.